Don’t let the Internet undermine Software as a Service (SaaS) deployments and performance. 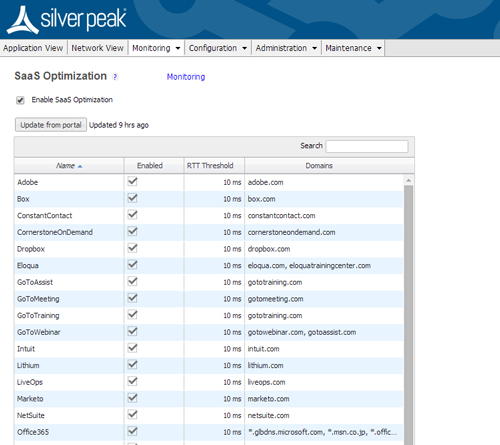 With Silver Peak, every SaaS application becomes faster and more consistent over the Internet. With Silver Peak Unity EdgeConnect, enterprises can build a WAN with broadband to connect users directly to applications. By empowering customers to use broadband connections to augment or replace their current multiprotocol label switching (MPLS) networks, Silver Peak improves customer responsiveness, increases cloud application performance, and significantly reduces capital and operational expenses. Silver Peak's Cloud Intelligence aggregates ever-changing information about SaaS providers, including the physical locations where the providers’ data is being served and provides minute-to-minute updates to Unity EdgeConnect appliances about Internet weather patterns. The appliances use this data to measure the loss, latency and other metrics from their locations to different services in the cloud. This information is broadcasted to all other instances on the Unity fabric, enabling Silver Peak Unity to calculate the optimal end-to-end path for any user on the network to any SaaS destination. Deploying Silver Peak software into IaaS hosts such as Amazon Web Services (AWS), Microsoft Azure and VMware vCloud Air provides a consistent and simplified way to extend your data center resources into the cloud. The Silver Peak Unity WAN fabric helps mitigate the limitations and concerns around deploying IaaS. Where there is a lack of consistent networking standards among cloud providers, Silver Peak offers a simplified way to set up connectivity to multiple IaaS vendors. Instead of managing complex firewall configuration rules, users can place a Silver Peak software instances in each cloud and easily establish a secure IPSec VPN connection without having to configure or manage the cloud provider’s default gateway. The potential for cost savings with AWS coupled with its scalability and resiliency makes the platform well suited for data centers network-intensive cloud initiatives, such as application hosting, cloud on-boarding, big data, and data replication.